Our popular Blacktop Collection now sports our latest chic yet subtle logo-embossed polyester fabric and features a new XL chair for enhanced comfort. The strong and lightweight blend of steel and aluminium in the frame complements the new fabric and provide full, Comfortable support in all the right places. The chic yet subtle logo-embossed polyester fabric of the Catamarca Arm Chair XL adds comfort and style while the durable high strength steel frames ensure reliable performance. 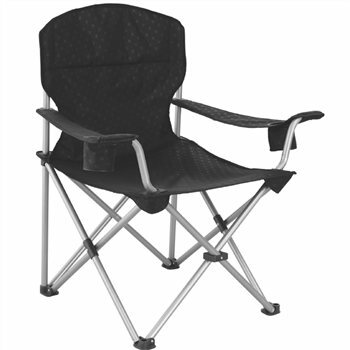 Very solid construction, providing that extra seat width and security for the heavier/larger person, and two up holders. Build quality is high and what you would expect for a premium quality chair. Folds down to a reasonable size and is still light enough to carry. Покупал, ориентируясь на невысокую цену среди стульев той же марки. Покупкой доволен. Отличительная черта - чуть больший размер. Опасался, что будут неудобно, страхи не оправдались. З столом сидеть не очень удобно, зато отдыхать - то, что нужно.